Background	Repair of ventral epigastric hernias with diastasis recti can be a challenging problem because it may require a large incision thereby leaving a visible scar in the upper abdomen. This scar may not be cosmetically acceptable to the patient. This large scar line is in a highly visible position of the upper abdomen which can make this elective surgery an undesirable procedure. Methods A series of 30 consecutive patients starting in January 2005 with primary ventral epigastric hernia with diastasis recti was performed in our institution. The patients presented for elective repair due to discomfort and visible bulging of the upper abdomen and underwent a minimally invasive tension free repair that was extraperitoneal in nature. 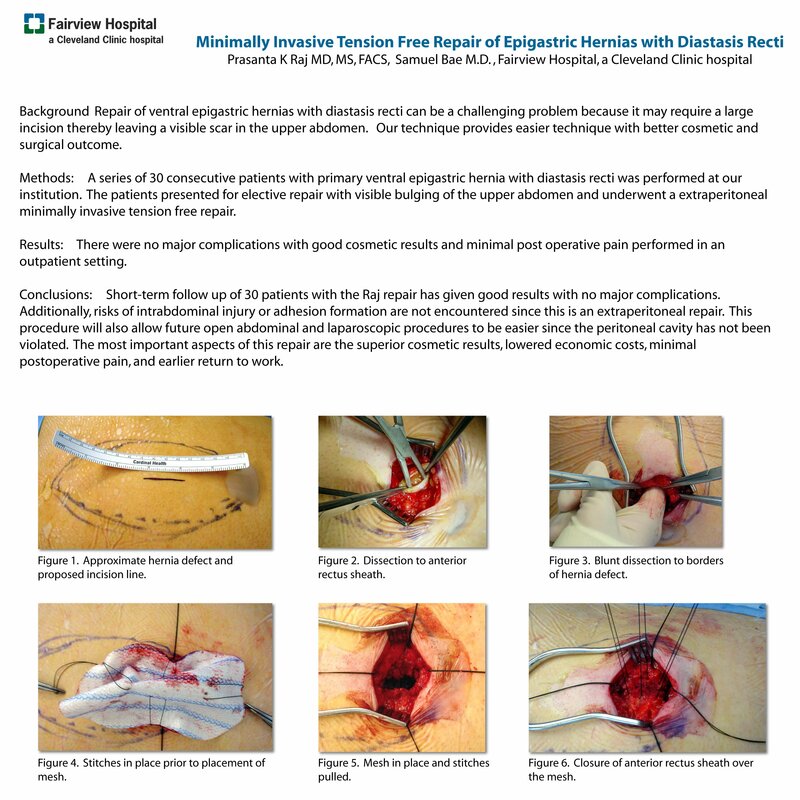 Results Of 30 patients undergoing primary repair for epigastric hernias with diastasis recti, there were no major complications in the short term follow up period. The scar line was minimal with good cosmetic result. The patients experienced minimal post operative pain. The surgery was performed in an outpatient surgery setting with minimal recovery time with full recovery in 1 week. Conclusions Short-term follow up of 30 patients with the Raj repair has given good results with no major complications. Additionally, risks of intrabdominal injury or adhesion formation are not encountered since this is an extraperitoneal repair. This procedure will also allow future open abdominal and laparoscopic procedures to be easier since the peritoneal cavity has not been violated. The most important aspects of this repair are the superior cosmetic results, lowered economic costs, minimal postoperative pain, and earlier return to work.